"This was a return to the fold, for one hundred and twenty two years had passed since a contingent of Williams men went from this valley over the hills to swell the rolls of the College then opening its doors in Amherst." Within two weeks of the bombing of Pearl Harbor, Robert Kitteridge '43, President of the Undergraduate Council, petitioned the administration for more courses of a military nature. In response, the administration organized a "Committee on Cooperation with the National Defense Program." Its goal was to "provide practical means to achieve (the) desire for the participation in the defense effort as expressed by the trustees, faculty, and the undergraduate body." Five courses were introduced, two as part of the regular curriculum and credit system, and three termed "extracurricular," for which no credit was offered. Of the two regular courses, one was simply a revamped astronomy course. Astronomy 3-4: Navigation, Meteorology, and Practical Astronomy, created by adding navigational studies to the old ASTRO 3-4. Mathematics 1b-2b: Math for Military and Naval Training was entirely new. Both proved very popular with students, and were filled to capacity immediately. Extracurricular courses proved to be equally popular. 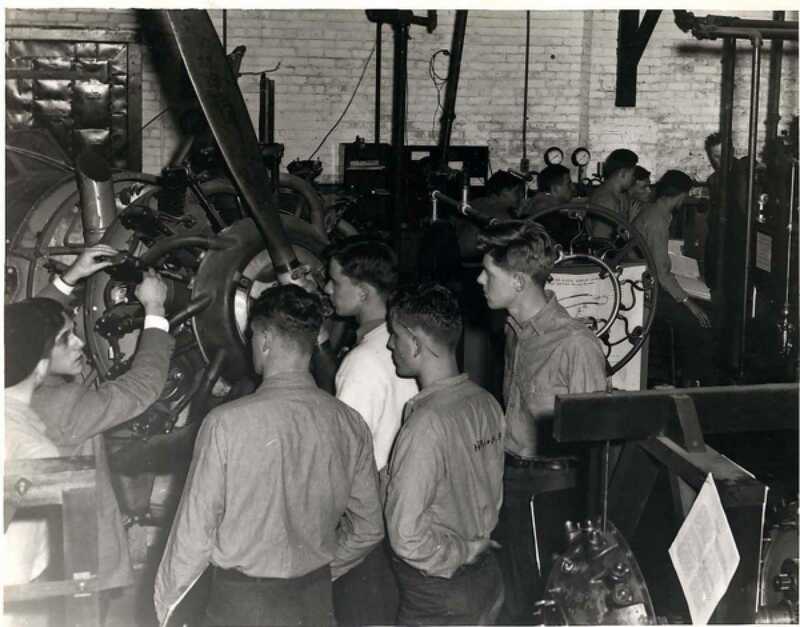 The most intensive was "Metal Shop Practice," offered by a physics professor, Ralph Winch, and the college's head machinist, George Woods. Taken by forty-one juniors and seniors, it met three hours a week for fifteen weeks. The course offered instruction in blueprint reading, metal inspection, pattern making, brazing, spot welding, use of a lathe, miller, and planer. 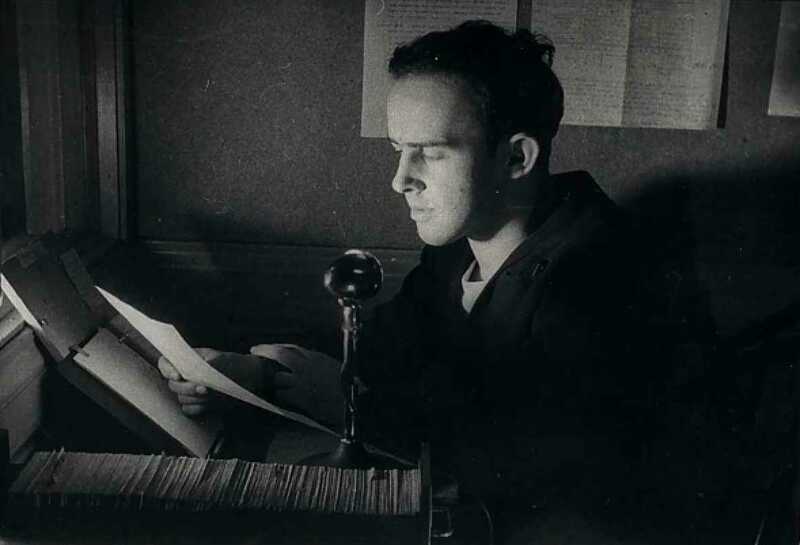 Physics Professor Howard Stabler offered basic training in radio work, including receiving, transmitting, and simple radio construction. Professor Stabler's course became part of the regular curriculum for the '42-'43 school year as Physics 5b and 11b. Those who graduated from Stabler's course entered the Signal Corps as radar men. 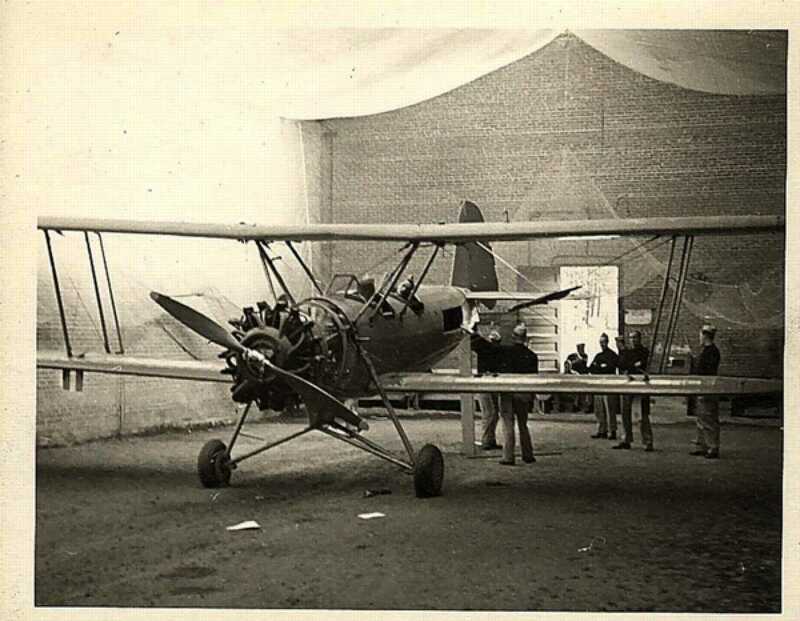 The Flying Club offered the third extracurricular course. Its lectures on elementary instruction in aviation ground work attracted over one hundred students from Williams and Bennington. "Because of the highly complicated nature of the instruments of modern warfare, the armed forces require very large numbers of men with technical knowledge and skills for which a background in physics and mathematics is essential...There is a serious shortage of men who are needed to operate and repair the many recently developed devices employing high frequency radiation for communications, detection, and fire control." In summer 1942 enrollment in physics courses quadrupled. Professor Stabler remembers feeling that there were students in his class taking physics for the sole purpose of having "a grasp of the subject to suit the military and not for the enjoyment that others found in the subject." In 1944, The American Institute of Physics ranked Williams twelfth in the number of physics majors for all the colleges and universities in the United States. World War II created increased interest in physics. Before the War, few students aspired to a research career in physics. Afterwards, however, a new attitude prevailed, based in part on physicists' major contributions to the development of radar, proximity fuses, and atomic weapons. As Professor Winch noted, "The physics profession is growing. A physicist is now looked upon as a useful animal, even in peacetime." As Williams civilian enrollment plummeted -- only 108 civilians enrolled for the 1943-44 school year -- so also shrank its faculty ranks. Many professors, almost exclusively in physics, and even a few students, were called away to do military-related research. In February 1943, Professor Stabler was transferred to the MIT Radiation Laboratory, a major center for wartime research. Professor Emslie soon joined him there. Professor Crawford, Chairman of the Physics Department, and James Curry, a chemistry professor, were called to the Radio Research Laboratory at Harvard. In 1944, two juniors were sent to the Radio Research Lab, and one was sent to Cal Tech for related research. In April 1944, Professor Park was transferred to the same Radio Research Laboratory, and then later to England. That left Professors Benefield and Winch, with some Navy instructors, in charge of the Physics Department. 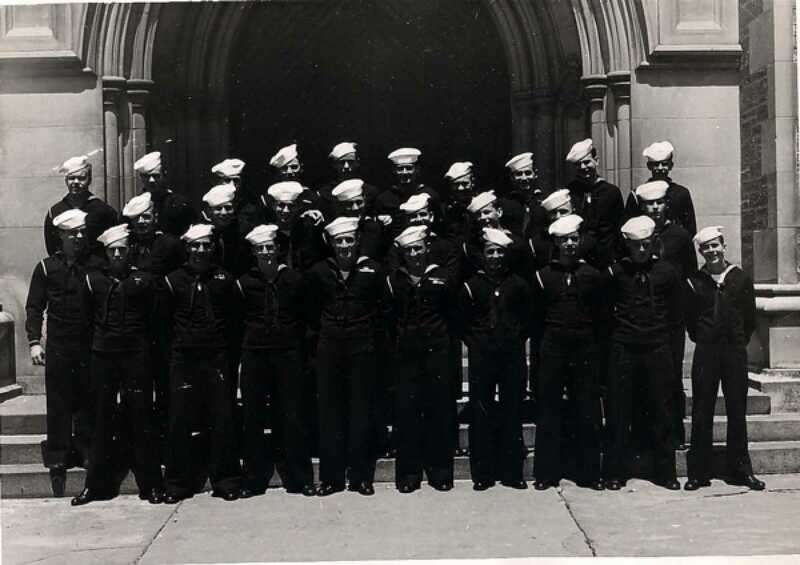 When finally Benefield was called away, Winch, alone, was not bitter about his overwhelming responsibilities: "We could not permit an electronics expert to teach Navy students when radar research was urgently needed for these students and others (if they) were to be kept alive and fighting". 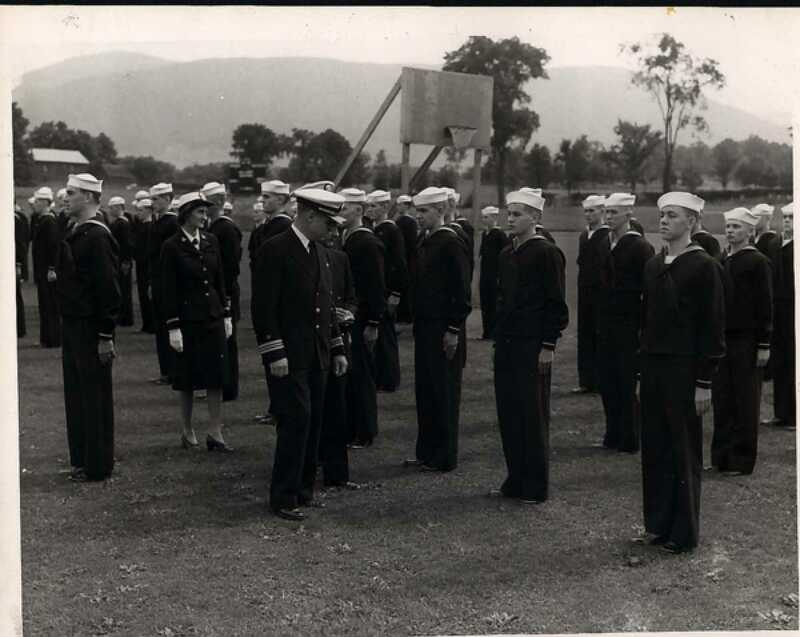 Thus, during the War, Williams physics faculty taught cadets some basic and military sciences, but made more enduring contributions away from Williamstown. Professors' sacrifices of time and the pursuit of personal research were major contributions in their own right. Professor Park recalled, "We were required to teach 102 hours per month during the war. Thus, we had no social life. But, we all understood that the effort was necessary. The essence of all war programs is that it is heresy to consider the end of the war imminent. Constant effort was necessary." Professor Winch, the remaining member of the Physics Department, provided an exemplary model of constant effort. Three temporary faculty -- Professors Fischer, Reinheimmer, and Beer -- were brought in to help Winch with the workload. Some of the Navy students helped as well. Later Winch rightfully expressed pride in the V-1, V-5, V-7 and V-12 graduates: "It is interesting commentary on the Williams training in math and physics that these men became 'staff members' and made valuable contributions with no more training." Even temporary help was not sufficient. Department capacity, in terms of laboratory apparatus and supplies, was 175 students; more than three times that number, 562, needed instruction. In the true spirit of liberal arts education, and with the patriotic fervor of wartime, other Williams faculty received some quick training and then taught physics in the V-12 program. The group included Professors Barrow from music, Beals from philosophy, Parker from theatre, Cole, Matthews, and Waterman from biology, and Perry from geology. Winch applauded their efforts and sacrifice: "The regular faculty members of literary and social science divisions saw here a job to be done, prepared themselves at tremendous cost of time and effort, and did the job with the usual high Williams standards." Not only did instructors learn new disciplines; sometimes they were forced to improvise teaching apparatus. For example, in 1944 Professor Kirkpatrick, one of the Naval instructors, needed apparatus for his V-12 course on steam and internal combustion. Williams had no such apparatus, so Kirkpatrick and others scoured the countryside for appropriate props. Winch recalls, "From abandoned mills, beached pleasure boats, and secondhand machinery dealers came the weirdest assortment of junk Williams ever saw." The old boiler room of the heating plant was refurbished, painted and the "junk" moved into the room. Kirkpatrick was able to get all the decrepit machines running, and trained 178 ensigns in the new Williams Heat Power Laboratory. Responding to the pressures of wartime emergency, faculty from all disciplines did their part as needed, some on a larger, national scene, some at Williams. They readily adapted to a new rhythm of teaching and administration, acquired new skills, and resourcefully created their own instructional materials in a time of scarcity. The sense of common commitment, involvement and shared sacrifice inspired extraordinary effort and achievement; it left its mark upon those who participated in the wartime programs. At war's end, however, former disciplinary divisions, loyalties, and commitments resurfaced. The technical would no longer dominate the curriculum. Nonetheless, in the words of Professor Park, "The military program instituted during World War II liberalized us all. It greatly boosted scientific awareness at Williams." The years immediately following World War II marked a brief period of enhanced interest and activity in the sciences at Williams. President Baxter's enthusiastic support of the sciences, the advent of graduate education in the sciences, and the resurgence of the Science Club all testify to improved status for the sciences. The fifties, however, seemed to to be a time of consolidation and evaluation of postwar change. World War II had increased interest in science on the part of both students and faculty. In 1954, the President's report of 1954 showed that there were 145 science majors out of 1,267 students enrolled in science courses. When compared with similar figures for 1937 and 1938, when there were only 80 science majors our of 1,039 students enrolled in science courses, it is clear that science's popularity had grown significantly in the post-war era. James Phinney Baxter '14 had come to Williams in 1937, after President Tyler Dennett, in his "Reign of Terror", cut funds to the bone, putting the college in a state of paralysis. Baxter was primed to bring great change to the college, but the Depression and then the War stifled his attempts. President Roosevelt, a personal friend of Baxter's, appointed him official historian of the Office of Scientific Research and Development (OSRD), a post which he held from 1943 to 1946. Baxter's account of the OSRD, Scientists Against Time, written during the War, won a Pulitzer Prize for history in 1947. More importantly, it introduced Baxter to all the great scientists of the world, and instilled in him a new love of science. Professor Park recalls this turning point for science at Williams, saying "The sun began to shine on the science department". By 1951, Williams had a new, modern physics-astronomy laboratory, and a new biology-psychology laboratory, as well as new graduate programs in the sciences. Authorized to grant a Master of Science degree, the College graduated six to eight students a year in physics, as well as one or two in chemistry. According to Professor David Park, first Chair of the program, Baxter began the program for three reasons: (1) students who needed extra course work for other graduate schools could enter Park's program for a short time, (2) graduate students could be used as teacher assistants, an advantage never before used at Williams, and (3) the Sprague Electric Corporation in nearby North Adams promised to help subsidize the program if it could send some of its research personnel for graduate level work in physics. At the time, Sprague maintained a large industrial research laboratory. When the corporation downsized and finally moved its laboratory in the late 1960s, the program gradually died out. Baxter also reminded the Williams College community that science was not the only subject of importance. Like his 19th century predecessors, he recognized that blind pursuit of science without the guidance of values and morals could have dangerous implications. Consonant with his view, President Baxter strongly urged students not to ignore courses that were short on technology but long in the big picture. "If men are to be asked to train, and perhaps to fight and die in defense of democracy, it is as necessary for them to understand its real nature, and the long struggles which have characterized its development, as it is for them to require the special skills necessary for industrial production. Important as are physics, chemistry and engineering alike in peace and in war, so too are the studies that develop tolerance, without which our nation may be hopelessly divided: a well grounded understanding of modern industrial society, more necessary than ever today; and faith, without which the cause of democracy would already have been lost beyond repair." The faculty, too, shared Baxter's vision of science as but a part of a well rounded and well grounded citizenry. In 1945,The Science Club, discontinued for security reasons during the war, resumed its activities. The club was composed of 37 faculty members, many of whom had conducted research in electronics and radar research during the war. Its president, Dr. Samuel Mathews of the Biology Department, stated that the club's new purpose would be, "A better understanding of the advancements in science with special emphasis on the effect of the war on these developments." The club sponsored a new series of lectures, held in "roundtable" format, to permit more open discussions in hopes of encouraging novel, thoughtful, or creative insights about the issues under deliberation. Frederick L. Schuman, Professor of Political Science, and Ralph Winch, Professor of Physics, gave one of the most interesting talks, on the implications of the atomic bomb. In a later talk Winch foreshadowed the eventual problem of nuclear proliferation. He stated that the U.S. would not have a monopoly on the atomic bomb for long (5 years at the outside) because, "in science, anyone who asks nature the right questions will get the same answer as anyone else, regardless of race, color or creed."